Captain: What we've got here is... failure to communicate. Some men you just can't reach. So you get what we had here last week, which is the way he wants it... well, he gets it. I don't like it any more than you men. Set in the rural south, a man serves time on a chain gang after vandalising parking meters. When inside, he stubbornly refuses to bow down to anybody, be it the prison authorities or his fellow inmates. Soon, though, he becomes a symbol of hope to the other prisoners and his rebellious nature teaches them that their integrity is the most important thing they have. This anti-authoritarian film is very much in a similar mould to Bonnie and Clyde which also came out in 1967. In both of these films the establishment are shown to be the bad guys and the criminals anti-heroes deserving of our sympathy. 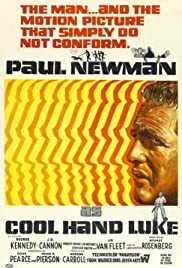 With this in mind it would only be fair to say that, like Bonnie and Clyde, Cool Hand Luke could be regarded as one of the very first New Hollywood movies. It certainly is a film which indicates that the cinematic norms were changing. It's also one of the first of a new type of prison drama which tried to reach for more authenticity. In many ways it is a precursor to the classic incarcerated-man-against-the-system movie One Flew over the Cuckoo's Nest (1975). For me, it's not in the same league as that one but it's pretty obviously a very influential work. 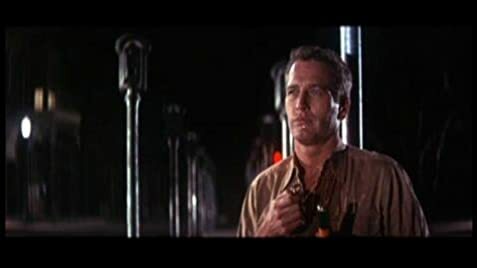 It benefits from a good ensemble cast, with Paul Newman leading the picture very well, with impressive support in particular from George Kennedy who would go on to win an Oscar for his efforts.